Swing Gals is Northern Ireland's first and leading all girl vocal collective. The girls are renowned for their sophisticated interpretations of jazz, swing, pop and easy listening favourites. The collective comprises singers Karen Kirby, Marion Jordan, Orla McKeagney, Ruth Jennings, Clare Galway along with their pianist and MD and Kathy McKeagney. The Gals have instant appeal across the age groups. They use dress and styling and their extensive repertoire to make them perfect for a variety of events. Perfect for drinks receptions, weddings, 20s evenings, 40s commemorative events, conferences and corporate evenings. The girls perform with a variety of lines ups. Vocal trio and piano, vocal trio and a swing ensemble and with the Indigo Big Band. 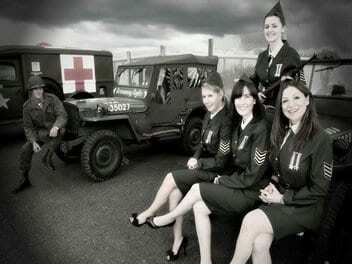 Swing Gals have performed at events and festivals all over Ireland, on television and on radio.